A higher priority on marketing is one of the top drivers of budget growth at B2B tech companies, according to a new survey. 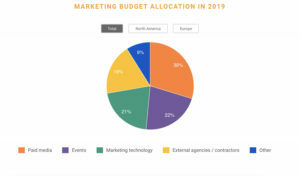 Forty-two percent of North American companies are anticipating an average 24 percent increase in their marketing budget this year, according to Spiceworks’ 2019 State of IT survey of 350 B2B marketers. For 51 percent, a higher priority on the importance of marketing was the top factor behind this growth, followed by customer expansion (48 percent) and increased company revenue (45 percent). Organizations surveyed said they allocate an average of 13 percent of their gross annual revenue to marketing. Where is that money going? Paid media accounts for 30 percent of the average marketing budget; 22 percent to trade shows and events; 21 percent for martech; and 19 percent for agencies and external contractors. Spiceworks’ survey showed that budgets for agencies and external contractors are earmarked for creative partners (30 percent), advertising digital partners (27 percent) and brand/PR partners (17 percent). Respondents overwhelmingly cited lead gen and new customer acquisition as their top priority for 2019 (73 percent), followed by increasing brand awareness (39 percent), cross-selling or up-selling existing customers (32 percent), and increased product awareness (31 percent). Top areas for martech spending in 2019 are content and experience tech (28 percent), social and relationships tech (20 percent) and advertising and promotional tech (19 percent). 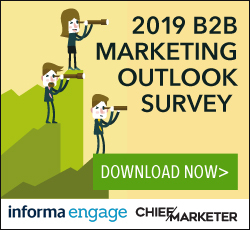 Chief Marketer’s 2019 B2B Marketing Outlook survey also indicated a rise in martech spending this year. Marketing automation topped the list of planned expenditures (45 percent), followed by video (43 percent), email marketing (40 percent), customer experience (38 percent) and social media management (37 percent).